Supporters crowded the streets to hear the verdict, but Yingluck never arrived. 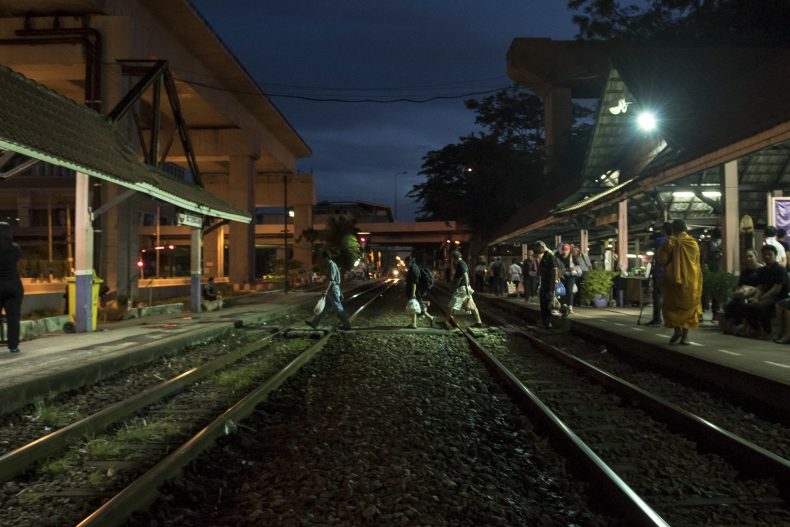 Her first supporters begin to arrive late Thursday night despite numerous highway checkpoints and train stations patrolled by both uniformed and plainclothes officers. Spreading mats and plastic sheets underneath an overpass near the Supreme Court’s entrance, they were intent on having the best view when Yingluck Shinawatra, or “Pu” as she is commonly known arrived the next morning. Officers review the security measures on Thursday afternoon in preparation for the crowds expected the following day. There were approximately 4,000 military and police officers on hand, while the final number of supporters is estimated to have been 3,000. The embattled former Thai Prime Minster was expected at Thailand’s Supreme Court early the following day (Friday) to hear the verdict handed down in relation to her government’s rice-pledging scheme. 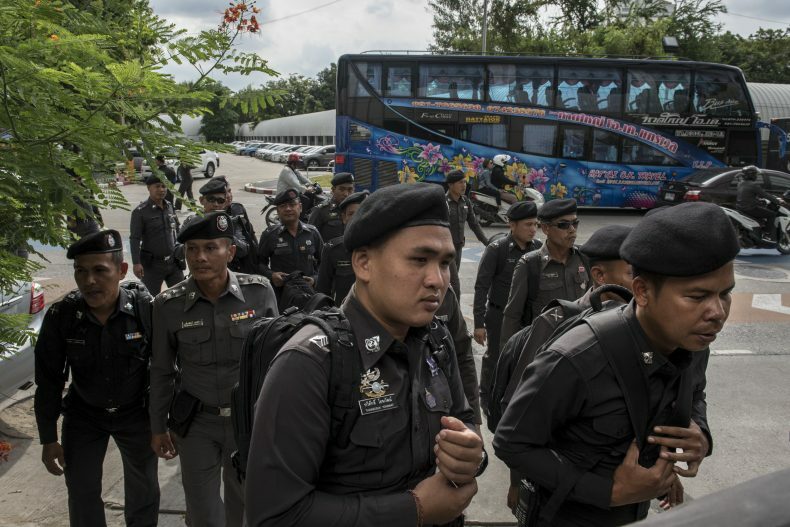 Officers bused in from out of Bangkok arrive at the Supreme Court late Thursday afternoon. Photo by Cory Wright. The scheme — a populist platform that helped her party secure election in 2011 — saw her government purchase rice from Thai farmers at a rate exceeding market value by up to 50 percent whilst attempting to manipulate global market prices. The Shinawatra government reasoned that since Thailand had been the world’s largest exporter of rice at the time, stockpiling would create a greater global demand for rice and subsequently drive up prices. Whether through negligence or blind optimism, the scheme ultimately failed and is estimated to have cost the government between $8 and $20 billion (USD). Prosecutors along with her political opponents alleged foul play and argued that, as prime minister, Shinawatra was criminally responsible. Standing accused of malfeasance and negligence, she faced up to 10 years in prison if convicted. 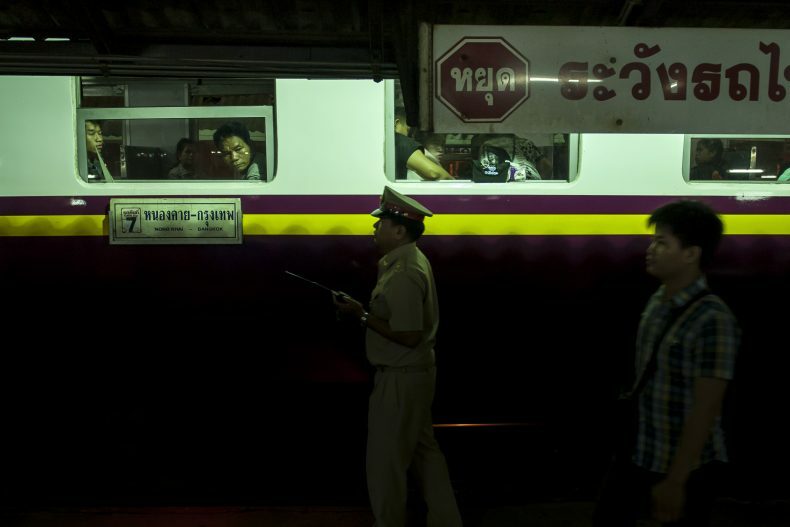 Early morning trains arriving from the country’s northeast were monitored closely by military and police officers for large groups and those capable of inciting unrest. Photo by Cory Wright. Many of the supporters for Yingluck at the courts made the trip from outside of Bangkok. At nearby Lak Si station trains arriving from Issan in the country’s northeast were closely monitored by officials. Photo by Cory Wright. 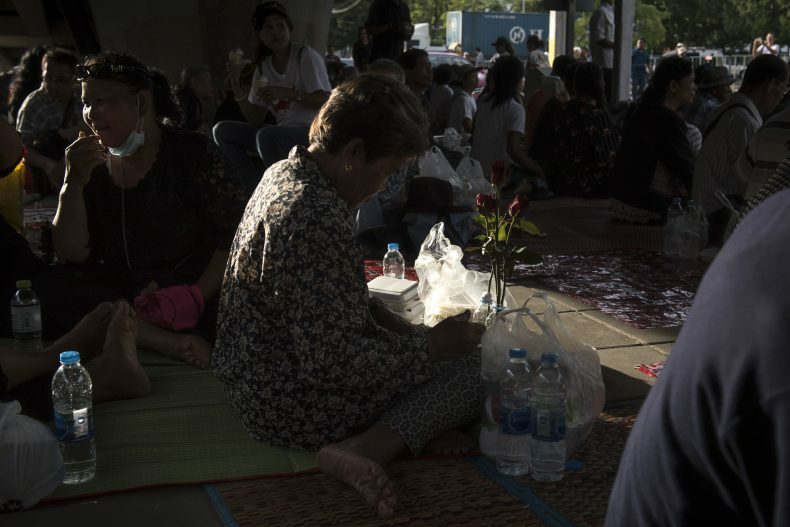 By dawn on the day of verdict, hundreds had amassed, some traveling hundreds of kilometres from rural Issan — a collection of provinces in Thailand’s northeast, home to many low-income agricultural workers and a political stronghold for the former Shinawatra government and its red-shirt affiliated allies. Pol Lt-General Viroj Pao-in, Deputy Leader of the Pheu Thai party, arrives early Friday morning among other party members and supporters for the verdict at the Supreme Court in Bangkok. Photo by Cory Wright. 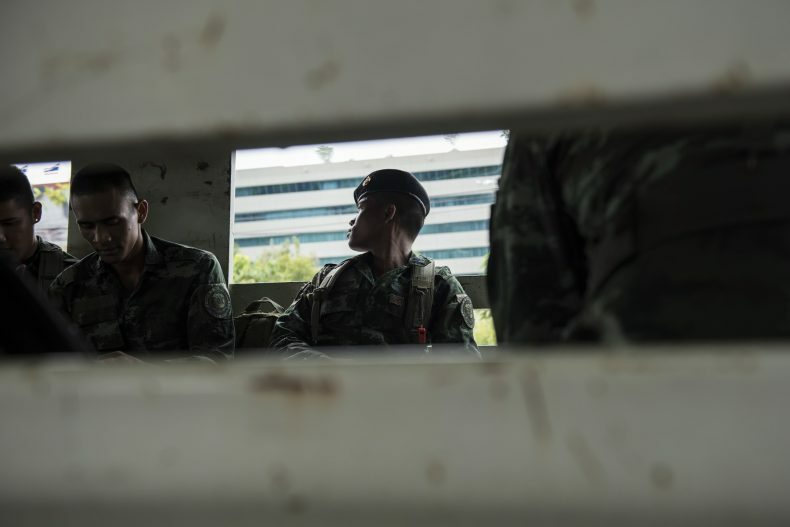 First light would also reveal the extent of the military government’s response to this support – 4,000 officers, both police and military, had been deployed with many lining waist-high temporary barriers at the court’s entrance. 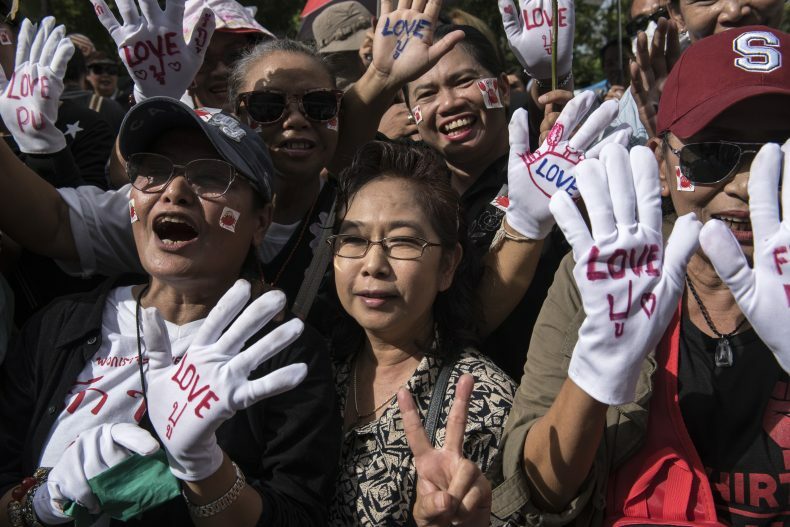 The number of Shinawatra’s supporters, many wearing red, rose to an estimated 3,000 at its peak late Friday morning. Yingluck supporters line the streets near the Thai Supreme Court prior to her expected arrival. Photo by Cory Wright. Nearing 9 a.m. — when all defendants were expected in court — a black passenger van with tinted windows approached the court’s entrance, leading a few supporters to believe that Yingluck was inside. The belief quickly spread and the van soon became paralysed by hundreds of supporters. As it reached the complex entrance however it turned away and continue on, leaving many confused and disappointed. As the 9 a.m. deadline passed it becomes clear that the former prime minister — who up until the day of the verdict had attended every court hearing in person and had often come out to meet supporters face to face — had failed to appear. A van initially thought to be carrying Shinawatra to the courthouse is mobbed by supporters and well-wishers as it inches along Chaeng Wattana road in Bangkok. Photo by Cory Wright. Following an unmarked van believed to be carrying Shinawatra crowds flood the streets, bringing traffic to a standstill. It was later revealed that the former Prime Minister had not been inside and had in fact skipped the court ruling altogether. Photo by Cory Wright. Inside the courtroom, Shinawatra’s lawyer issued an official statement to the court that his client had suffered from vertigo stemming from Meniere’s disease and had asked for a postponement of the ruling. Lacking a medical certificate the court rejected the explanation and a warrant was swiftly issued for her arrest. 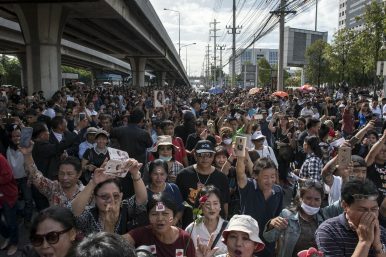 Shortly after crowds realized that Yingluck had missed the deadline to be at the courthouse, trucks carrying military personnel passed through and were quickly denounced by the crowd. Photo by Cory Wright. Outside, despite the confusion, many remained hopeful that “Pu” would soon arrive. An elderly man wearing a red shirt and headband paced in front of the crowd assuring everyone that Yingluck was indeed coming and she would be there at 2 p.m. Upon hearing that “Pu” was sick and wouldn’t be attending, some begin packing up and heading home. For those who had travelled from the country’s northeast, this would be a long trip, and the hottest part of the day was fast approaching. Others were already convinced that she’s fled. 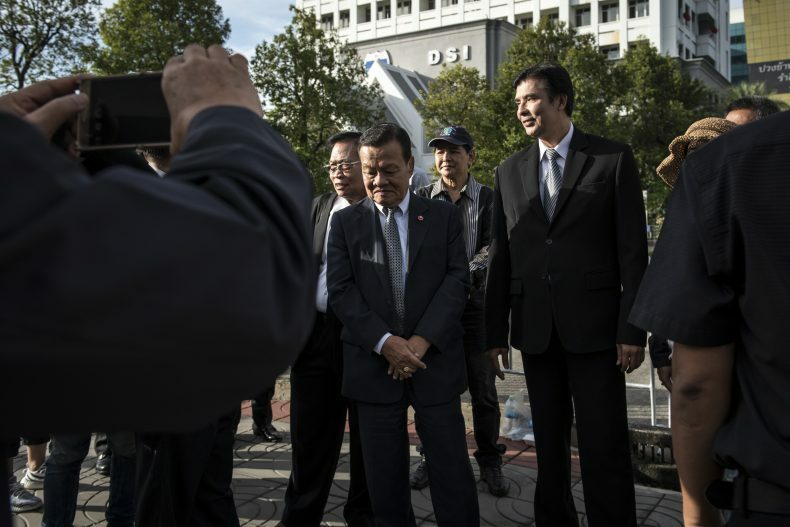 Their initial excitement resigned to a familiar disappointment: Yingluck had fled in the face of impossible odds stacked against her just as her brother Thaksin had in 2008. This, her supporters say, is hardly surprising since the courts are politically motivated and aim to destabilize the Pheu Thai party. 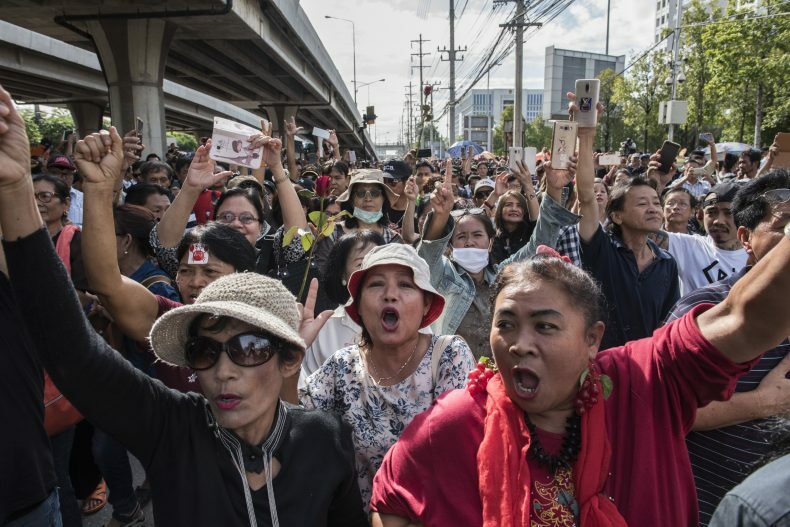 Excitement briefly gave way to confusion before eventual disappointment when supporters — especially for those who had traveled long distances — came to the realization that Yingluck Shinawatra was not coming. Photo by Cpry Wright. 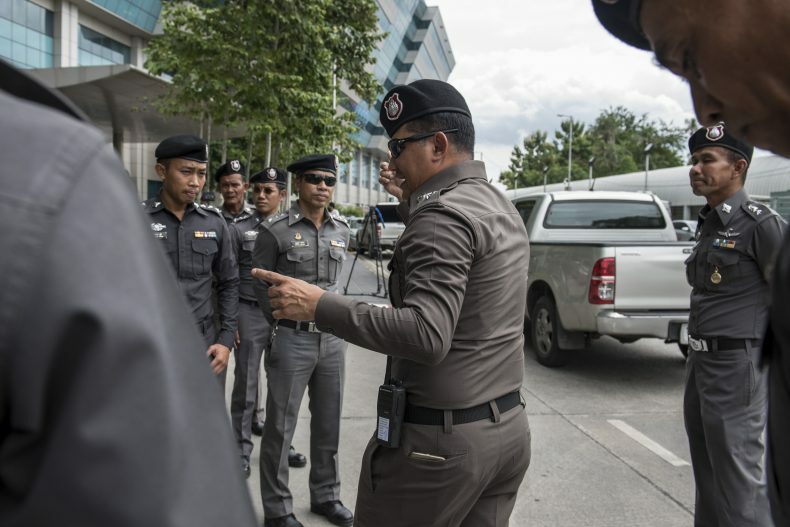 The possibility that Shinawatra had indeed fled has quickly become the most likely scenario. The day after her absence at the Supreme Court, Thai media was already asserting that the former prime minister had indeed fled the country. The Bangkok Post quoted sources close to Shinawatra, as well as those in high ranking government positions confirming she is no longer in Thailand; they suggested she is now in Dubai, where it is thought that her brother Thaksin currently resides (although it remains unclear at the time of writing exactly how she may have done this and which route she would have taken). If true, it would point to the end of the Shinawatra era in Thailand and leave a fractured Pheu Thai Party without its popular leader. 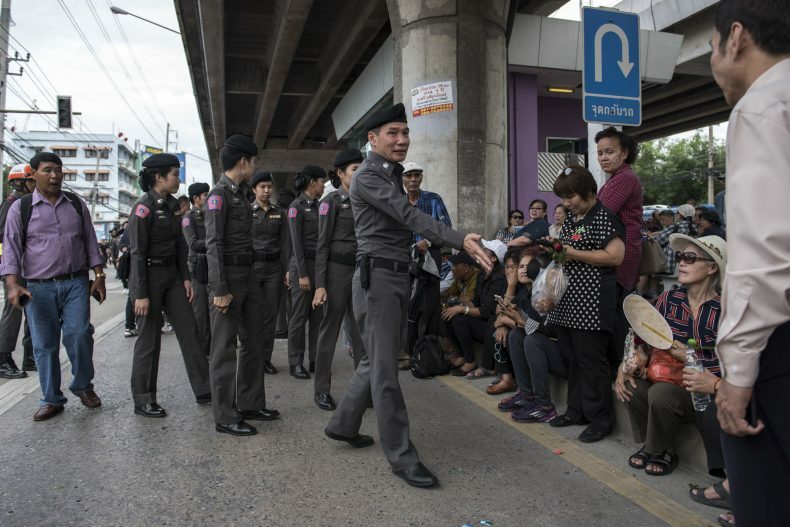 As some of the crowed began to leave police seized the opportunity to push back those along the road in order to increase the flow of traffic. Photo by Cory Wright.